For those of you that know me personally, you are probably already aware of my two greatest passions. For those of you who don’t, one is obviously film and filmmaking, the other is music. I’ve been a guitar player for about 12 years now, have had some success in the local scene over the years with several bands, most notably with Jaxon Jill from 2007-2009. So, to bridge the gap a bit here on the blog I’m starting a new series that will have updates ever so often. The series will be called the Music on Film Series and include popular, and not so popular, films that have either been of live concerts, taped recordings or other instances in which music is the predominant subject of the visual image. 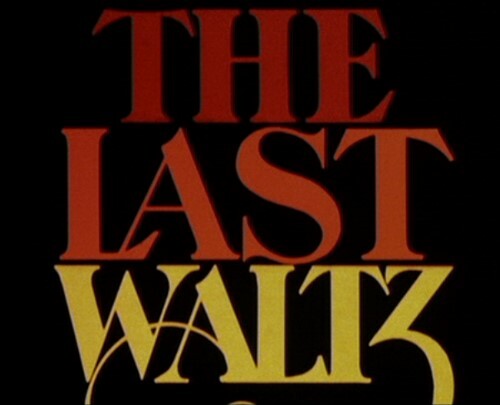 In starting this little ongoing series, I feel it is only fitting to begin with my favorite concert film of all time, The Band’s The Last Waltz. I remember the first time I ever heard The Band, it was truly an hear opening experience, if you will. I was at the local Borders in Winston-Salem, which unfortunately is currently going out of business with the rest of the chain as we speak, and I was listening to various albums they had available with headphones. I was maybe 14 or 15 years old at this time, just beginning an interest in classic rock and roll that would continue to this day. When I came to the CD of The Band’s Greatest Hits, which at the time had just been released on compact disc, I put on the headphones and hit play for a sample of the first track, their classic hit “The Weight”. As I continued sampling the album through “Tear of Rage”, “I Shall Be Released”, “Up on Cripple Creek” and “King Harvest”, I became enamored with their style and musical influences. Their sound is such a perfect blend of Blues, R&B, Rock and Roll, Country and Folk, and the voices of Levon Helm, Richard Manuel and Rick Danko blend so beautifully and harmoniously, that the music itself literally becomes timeless. Needless to say, I bought the album on the spot and it continued to be a staple of my car CD system for years to come. As I became more and more interested in their music, I caught wind of their final concert, The Last Waltz, which was filmed at the Winterland Ballroom in San Francisco in 1976. The concert film was directed by none other than iconic Italian-American filmmaker Martin Scorsese. Scorsese and The Band collaborating on a celebration of the music at a live concert was too good to pass up. At the time nearing my birthday, it was a first choice for present from my parents; once received, I played it from beginning to end on the big screen TV with the sound system all the way up. The film features not only a large number of iconic Band tunes, but also has a multitude of musical guests joining the band on stage for one to two songs. Guests include Van Morrison, Neil Young, Dr. John, Neil Diamond, Bob Dylan (who the members of The Band were the backing band for before going out on their own), Eric Clapton and Muddy Waters, among others. There is nothing quite like hearing many of these songs live when the group was at the height of their fame; the energy of the performances are breathtaking. Interspersed between the music are interviews with members of The Band about their life and times with The Band and being musicians in general. In their down time from Doctor Who, current series head Steven Moffat and Mark Gatiss set out to create a modern update on Sir Arthur Conan Doyle’s classic Sherlock Holmes. Season One of the joint BBC and Masterpiece production aired in the summer of 2010 with three episodes, each totaling 88 minutes in length. The first episode, A Study in Pink (an obvious take-off on Doyle’s “A Study in Scarlett”), lays out the groundwork and exposition for the characters of both Holmes and his associate Dr. John Watson. This episode also introduces the two to each other for the first time, and has them decide to be roommates at the famous 221-B Baker Street address. Staying very true to the books, all the idiosyncracies of the characters and their backgrounds are in tact, just with modern updates. For instance, Watson served in the recent Afghanistan conflict in this version, where he received the bullet that injured his leg. 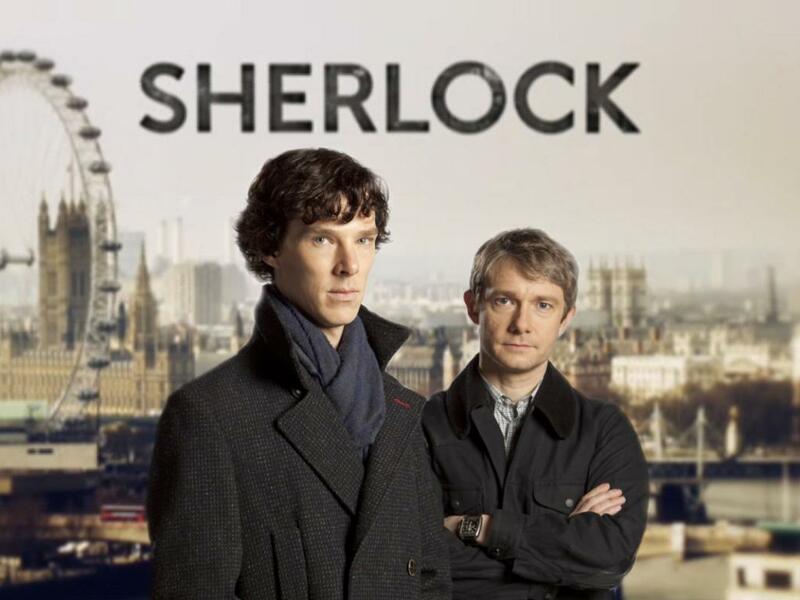 Benedict Cumberbatch plays Holmes and Martin Freeman plays Watson; they are both excellent in their roles. I especially enjoyed Freeman’s performance as Watson; however, I am a bit bias, as my favorite character in the Holmes’ stories is generally that of Watson oddly enough. I mean how cool would it be to be the companion of a mind like Holmes’s, a crack shot with a revolver and an expert medical doctor all-in-one? Plus, you get the ladies and generally stand as a voice of reason to the sometimes aloof Holmes. Not only does the series get placed in modern London, but they take expert advantage over the situation by incorporating many technological advances into the scripts. Laptops, cell phones and other digital media devices are made use of in all three episodes extensively, sometimes even as key elements to the plot. In addition, the producers came up with a clever way to visually present the use of such devices. Rather than boring shots of a cell phone screen, they have animated text appear over the image to signify various text messages, etc. The second series will be broadcast this fall in the same manner as the first, with three hour and a half long episodes. I enjoyed Guy Ritchie’s theatrical version of Sherlock Holmes (2009) and am looking forward to the sequel later this year, but, though fun, it wasn’t a great movie. This modernized adaptation of the classic stories is a different story; I don’t mind at all admitting that it is a brilliant, fresh take on series. I absolutely love it. For all you Netflix users out there, all three episodes of season one are available on Instant Watch. 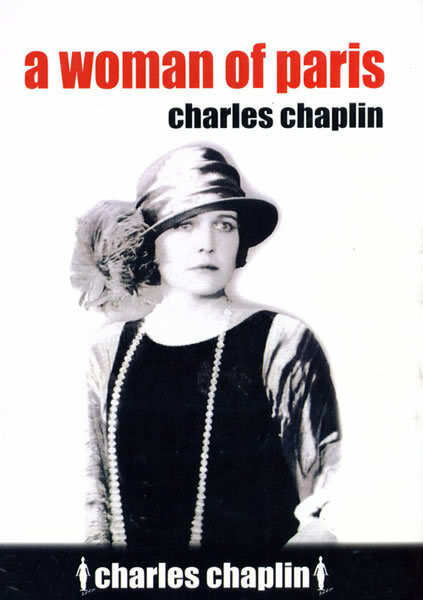 Continuing our review series through the feature films of Charlie Chaplin we come to what, I would say at least, is probably his least well-known feature, 1923’s A Woman in Paris. 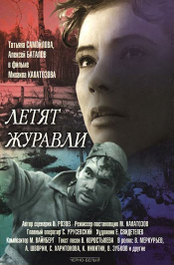 Outside of not being as well known, this film holds another distinction: it was a serious drama. Not only that, but Chaplin only took the writer/director/producer positions and only appeared, very briefly, as a porter with no lines. Chaplin was famous for helping boost the careers of his various love interests through the years, as evidence will show in the films to come. However, of all his romances, he probably gave Edna Purviance the best role, because this film had her as the leading actress without being a supporting character to Chaplin. Unfortunately, despite his best efforts, the film didn’t propel Purviance to the level of stardom originally hoped, though it did end up helping Adolphe Menjou’s career to a degree. The film is a melodrama that focuses on Purviance’s character of Marie St. Clair. Her and her young boyfriend, aspiring artist Jean (Carl Miller), are planning to elope. The night before their plans to move to Paris for marriage, Marie climbs down from her window to meet Jean in the courtyard. When Marie’s father sees this through the window, he disowns her and kicks her from the house insisting that, “Maybe he will give you a room for the night!” Marie follows Jean to his house, but finds that his parents aren’t happy about the arrangement either. With nowhere to go, she decides to head for Paris early, Jean promising to follow her the next day. However, when he gets back inside his home, he finds his father has died. Because of this, he doesn’t make it to Paris as scheduled. Time goes by and Marie becomes a mistress to the wealthy Pierre Revel (Adolphe Menjou). One night, by chance occurrence after a party, Marie wanders into the wrong room and finds Jean, who now lives in Paris with his mother. Marie asks Jean to paint her portrait in his studio. During their meetings for the portrait, Marie finds out about Jean’s father’s death and they begin to rekindle their romance. Without spoiling the ending, I will leave it at, just as things look good for the young couple, more effects of fate set in. Compared to Chaplin’s comedies, this film was not nearly as well-received as most of his other work from the same era. Like many comedy directors, it is sometimes hard for an audience to accept them with drama. However, if you look at the melodramas being produced by other directors of the same time, this film actually works quite well and is better than many of its competitors. Woody Allen is a similar artist who seems to fall into this paradox. For years he has tried to make dramatic films interspersed with his comedies and, almost always, his dramas don’t fair as well as his comedies; except, perhaps, with Match Point. Chaplin never made another film that was solely a drama. In the 1970s, when he was in the process of recording scores for many of his silent films, he wrote and recorded a score to accompany this piece. This would also mark the last time that Chaplin worked with Purviance as a leading lady. However, his care for her continued for many years; supposedly, long after using her in any pictures, Chaplin kept her on the studio payroll to keep up her livelihood. For the next eleven days, I am going to be doing a special Chaplin in Review series which will be a Chaplin Feature review, once a day, of his eleven feature films from 1921 to 1967. Going in chronological order, the first film on the table is 1921’s The Kid. While completing his obligatory two-reelers for First National in the late 1910s, Chaplin built his own studio, Charlie Chaplin Studios, and started United Artists with Mary Pickford, her husband, Douglas Fairbanks and D. W. Griffith. 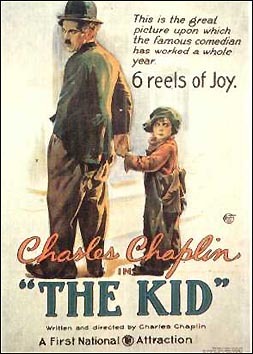 In 1921, though released through First National rather than United Artists as many of his future features would be, Chaplin released his first feature (at least where he was in creative control), The Kid. The film allowed Chaplin, for the first time, to develop the style that he would ultimately be known for: the comedy drama. The story starts with Edna Purviance, as a mother, who can’t keep her baby child. In hopes the child will grow up in a better situation than she can provide, she leaves the baby with a note in a millionaire’s car. However, by chance, the car is stolen and the thieves find the child, leaving the baby on the side of the street. Chaplin, playing the eternal Little Tramp, finds the baby. At first, he is reluctant to bring in the child, but in the end he does. Five years pass and we see that Chaplin and his found son (Jackie Coogan) are quite close; actually, they are literally partners in crime. The young Coogan breaks windows, while Chaplin as a window fixer comes to offer repair. In the meantime, Purviance’s character has become a wealthy star who volunteers at various charity organizations for children to cope with leaving her poor son so many years prior. When the boy falls ill, a doctor finds out that Chaplin is not the father, and orders men to take the boy. From this point on, between various authorities and a reward from the now wealthy mother for $1,000, the boy and Chaplin’s relationship seems in deep peril. The final scenes and dream sequence elucidate the mastery of Chaplin as an auteur of the film medium. Coogan, who at the time was a vaudeville actor, became a huge movie sensation because of this film. Funny as though it may seem, the cute kid Coogan eventually played Uncle Fester on the 1960s Addams Family television program as an adult. Also, following the production of the picture, the negative became a part of a divorce struggle between Chaplin and his first wife, Mildred Harris. She tried to get rights to the picture, so in an attempt to save his “baby”, Chaplin and several colleagues went to a hotel room in Salt Lake City with the negative to finish cutting and finalize the picture. A sequence depicting this true life occurrence was produced in Keystone Cops chase vain for the biographical film Chaplin by Richard Attenborough in 1992. In the end, Chaplin prevailed, and the film nor its rights made their way into Harris’s hands. Like most of Chaplin’s features to come, The Kid was written, directed, produced, starring and, eventually, scored, by Chaplin. Unlike many films of today that state “A ____ film” at the head credit, Chaplin’s films were most definitely his. Every nuance was closely observed by Chaplin himself and tailored to his specification. To make a film that not only, as the head credit says, is a “…picture with a smile-and perhaps, a tear,” but to do it with such a consistent mix of comedy and drama intertwined is truly an amazing achievement. My two favorite sequences in the film are the sequence where the kid is taken from Chaplin by the orderlies under orders from the doctor and the dream sequence with the angels and demons (one such young angel being Lita Grey, Chaplin’s future wife). The absolute horror and heartbreak as the young Coogan, crying and screaming, as he is taken away from his father is touching on every level. Not giving up without a fight, Chaplin’s Tramp races over the rooftops after the truck the kid is in – arms outstretched, needing each other to go on in life. In the dream sequence, the exquisiteness of Chaplin’s ideals of good and evil come to a front between a utopian city of angels and the lecherous villains of the underworld who come to dismantle all that is good. Even after 90 years, this film still holds all the smiles and tears that it first offered to audiences in 1921. I’m sure it will continue to stand the test of time and think this is definitely not a bad place to start with Chaplin if you are generally unfamiliar with his work. Apologies on the sparse posting as of late. I’m usually not much of a television fan, but have been engrossed in two shows over the past couple of weeks. 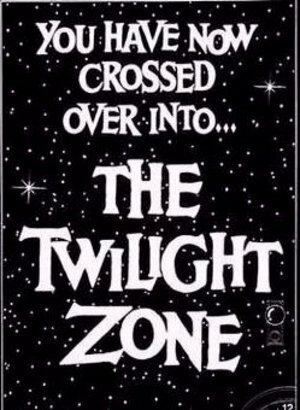 First, I’m still moving through the original Twilight Zone episodes; the reviews, which are updated regularly, are available on the Twilight Zone master guide page which is located here: https://notesonafilm.wordpress.com/twilight-zone-master-guide/. I hope you’ll check it out and find some episodes that fit your taste! The other show that has dominated my life, and much more so, as of late is the British science fiction classic Doctor Who. I’ve long thought the series would appeal to me, but I try my hardest to avoid television programs (or programmes more appropriately for a British show) when possible because of the time commitments. However, I have gotten myself sucked into yet another with this series. Originally, Maddie and I were going to start with the original Doctor Who from the 1960s and try our best to move forward through the entirety of the series. We actually did watch a few of the original episodes from the William Hartnell era and, though quality was not good because of magnetic tape storage, the stories were very interesting and held up quite well! Being a show that has had almost 800 episodes, however, we soon decided to take a friend’s advice and start with the 2005 re-boot of the series by Russell T. Davies, which updates the viewer on much of the terminology and makes it so you don’t have to watch the previous 700 episodes to know what is going on. Because of the BBC’s “cleaning tape” policy of the 1970s, many of the original episodes are unavailable. Also, though the stories were intriguing, the dated sets and low production value of some of the early episodes were a bit hard to get through. So, about a week and a half ago, we began the 2005 series which starts with the appearance of the ninth doctor, portrayed by Christopher Eccleston. We just finished the first season and regeneration into the tenth doctor (David Tennant) and are decidedly hooked on this series. The first season wasn’t the best looking because of being shot, obviously, on Digital Betacam in 4:3. However, the stories, performances, direction and, for the time impressive CG sequences, really propelled the series and took the mind away from the video-like look of that season. Having just watched the special Christmas episode and first episode of the second season, it looks like they made a huge jump in what camera they were using, as it’s 16×9 and 24p (still not sure if it’s SD or downrezzed HD, but looks WAY better). In short, don’t be surprised if the posts are a bit sparse for a bit while I continue to navigate space and time in my living room. Do check back frequently for Twilight Zone updates though and I will have a special post when I get the full first season watched and reviewed. Thanks for your patronage and hopefully my eyes won’t bleed out of my head in the coming weeks from too much sitting in front of the tube! Maddie and I have gotten a little lax on finishing Twin Peaks. We only have four or five more episodes to go before finishing the series completely, but we have taken a decent amount of time ever since the Laura Palmer episodes ended in watching new episodes. A full series recap will be forthcoming once we finish. In the interim, outside of watching movies, we started to spark up some of the old Twilight Zone episodes (original series era 1959-64). It’s been awhile since I’d seen any Twilight Zone episodes, so I was excited to see that Netflix has nearly 140 Rod Serling-era episodes on instant watch. Whatever is not up on the instant watch, I’m sure I will be able to find in my brother Patrick’s collection. He literally has every episode of the entire original series and, if I am not mistaken, has seen all of them at some point or another, possibly twice. Anyway, since Maddie had never seen an episode of the show, I felt it only right to introduce her. Last night we saw three episodes. I was immediately entranced with the series just as I had been years ago when watching them late night on the Sci-Fi Channel, and Maddie really enjoyed the episodes as well. As an ongoing feature here at the blog, I will rate the episodes as I see them. Hopefully, as time goes by, you’ll be able to check back here and get a nice overall guide to the entire series. Once all episodes are watched and rated, I will make a main page with chronological listing from season one through season five. Released on October 30, 1959, this episode was directed by Robert Stevens, written by series creator Rod Serling and starred actor Gig Young (eventual Academy Award-winner for Best Supporting Actor in 1969 for They Shoot Horses, Don’t They?, whose career later ended in tragedy). Young plays a middle-age advertising executive from New York, Martin Sloan, who is traveling back to his hometown on a whim for nostalgia’s sake. When he arrives, however, he finds that the town is just the same as he remembers it and, eventually, realizes it actually is the same. He has traveled 25 years into the past, where he runs into his mother, father and former self. The direction of this episode and cinematography by series DP regular George T. Clemens is amazing. The final scenes, with their dutch angles and atmospheric lighting, create an intriguing dream-like effect. Time Magazine later rated this episode as the eighth best of the series. Released on November 20, 1959, this episode was directed by John Brahm, adapted by Rod Serling and starred actor Burgess Meredith (probably best known as the coach in the Rocky series or Jack Lemmon’s father in the Grumpy Old Men series). Meredith portrays bookworm bank teller, Harold Bemis, who is constantly in trouble at both work and at home for his insatiable reading habits. While retiring to the bank safe to satisfy his desires, a Hydrogen bomb wipes out everything above ground. Bemis exits the safe and realizes that he is the only person left in the world. This episode is based off the short story of the same name by Lyn Venable and won director John Brahm a DGA award for excellence in television directing. Meredith would go on to appear in several other episodes in the series and this episode is consistently rated as one of the best of the series. Released on February 5, 1960, this episode was directed by William Claxton, written by Richard Matheson (of I am Legend, Stir of Echoes, Incredible Shrinking Man, etc. fame) and starred British actor Kenneth Haigh. When Flight Lt. Decker (Haigh) gets lost over France during World War I in 1917, he lands his plane at an air force base. Unbeknownst to him, he has landed at Lafayette Air Force base in 1959. The Major General of the base at first thinks his outfit, plane and story are some kind of joke. In the end, however, they realize he is not joking and this chance landing in another time is important in helping Flight Lt. Decker do the right decision in his own time. Though not necessarily as flashy or well-revered as the other two episodes I reviewed today, I really liked the plot of this one. It kept you interested from beginning to end and Haigh’s performance was perfectly on par.